Thanks a lot for the reply, CW. I will then stick with 3.4.0 for now for my game. Can you tell, how do you build for iOS with 3.4.0? Do you build iOS project yourself or someone is helping you? Also I've seen information that it's a part of KB2999226 update. Please tell if that worked. Windows 10 (x64) running in a VirtualBox VM. I installed the VS2015 redistributable (thanks! ), but still get the same error. Hmm... ok, not sure about this. 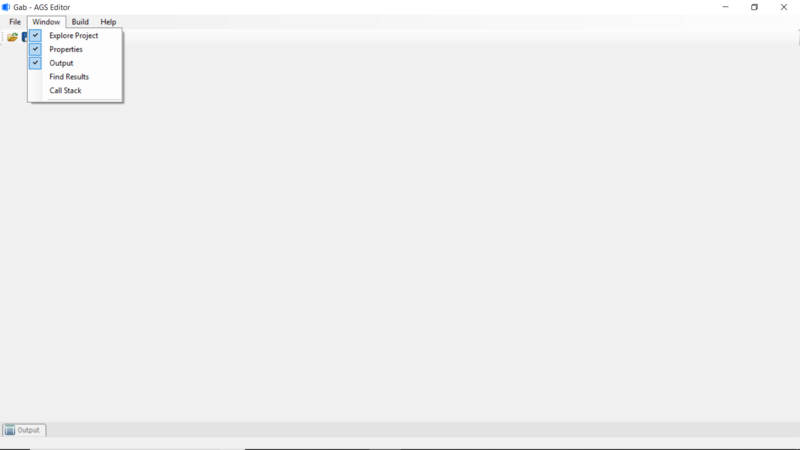 My properties and other editor windows disappeared. 1) Look into the "Window" menu and make sure these windows are checked. 2) If that does not work, go to C:\Users\<Your username>\AppData\Local\AGS and delete Layout.xml (do this when Editor is closed!). It is indeed my girl-friend who set up the port as she is experienced with iOS development. I haven't really followed what she has been doing in detail though. I think our iOS build is based on the original AGS iOS port but also with adjustments from Janet Gilbert's version. Each version separately did not work on its own. The last problem we had e.g. was WAVs not playing but I can't remember what her fix was. We made some other adjustments as well... e.g. in the AGS game I detect whether there is a file called "touchmode" in the savegame folder. If there is, the game sets a global variable TOUCMODE which switches to "touch mode" (surprise!) with a number of adjustments for touch devices (like showing no cursor, some hotspots being bigger, some puzzles different, etc.). In our iOS wrapper we automatically generate that file if it doesn't exist. Now, I can work on the game without having to worry about building a specific version and I can even use the same savegame from different environments. Afraid the fix did not work. No matter what version I installed the properties etc windows do not show up. Apparently there is no layout.xml file on my system. Could you do a printscreen of your AGS screen? Are you sure? because it must reset to default in such case. Usually you can get there by typing "%USERPROFILE%\AppData\Local\AGS" in the windows explorer path line. I go to that address and it is not there. I searched for layout.xml and nothing comes up. File explorer wasn't showing the correct location for some reason. I deleted layout.xml and I got the windows showing again. 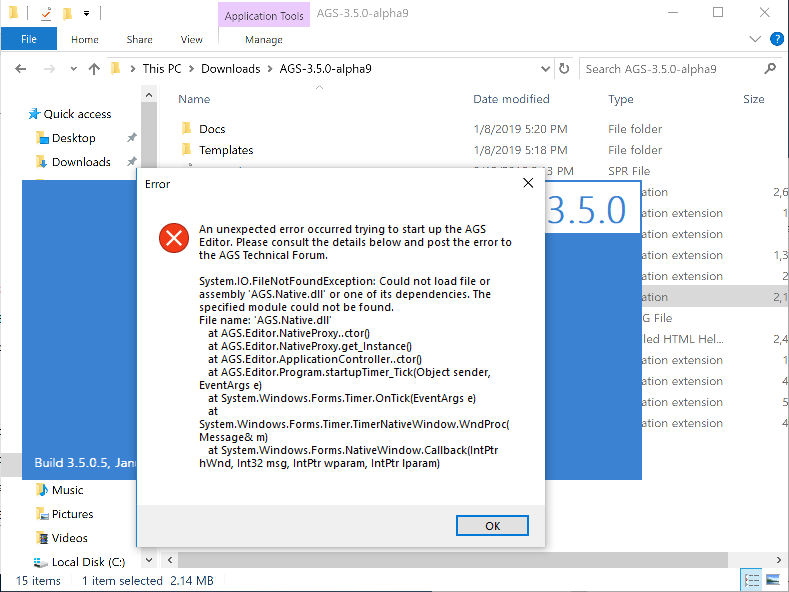 Please tell which version of AGS are you using? Maybe we may make a test build that resets panes or tells where the layout file actually is. Seems to work differently each time. Oh that may be my mistake. The first address I gave was working for Windows 7, but Windows 10 probably has slightly different one. So, if I understand correctly, the problem is solved now? WARNING: there was a major internal modification to the Rooms code recently (since previous alpha 9). Please make a full backup of your project before upgrading to this version and report if you notice anything wrong with how your rooms are saved and loaded in the editor and run within the game. In summary, this is a small but cruicial bug-fixing release. - Use Magick.NET library as a GIF loader. This should fix faulty GIF imports. - If sprite import failed with data error AGS will instead create a placeholder image. - Better crash prevention when reloading existing sprites from source. - Fixed crash in the sprite import window when dragging selection box outside of the image. - Fixed errors when importing of old-format rooms, as well as using room templates (regression). - "Import over font" command now supports importing WFN fonts too. - Reported by Snarky: need to find out which components need to be added to use AGS 3.5.0 on fresh Windows installation.